CC's Hideaway has been recommended to me several times by customers from our dive shop who give it rave reviews - friendly staff, attention to detail, beautiful decor and "that something extra" that makes CC's Hideaway (previously called CC Blooms) more than just another hotel. 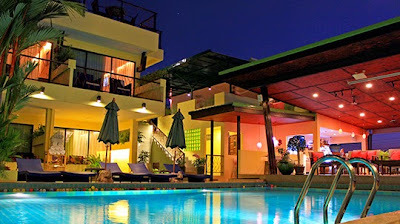 OK, it's not by the beach, but the location in the hills of Karon is just as nice. Plenty of fresh air, great sunsets, nice and quiet. There is a free shuttle access to Kata Noi, Kata and Karon beaches. The original name of the hotel was CC Blooms, which came from the Bette Midler character in the movie "Beaches" (I must say I have never seen it, but might just try to find it at the local video shop now...). Beaches seems to be a very popular movie with gay people, and indeed CC Blooms was promoted as a gay, or "gay friendly" hotel. My customer said he had met the owner, a gay American man and maybe the "gayness" of the hotel gives it the unique style. Of course you don't have to be gay to stay here. Read the reviews on Agoda (see links below) - the hotel is rated very highly by just about everyone. The hotel still mentions being LGBTQ friendly, whatever that means anyway! I think you can take that to mean that everyone is welcome, as everyone should be everywhere. 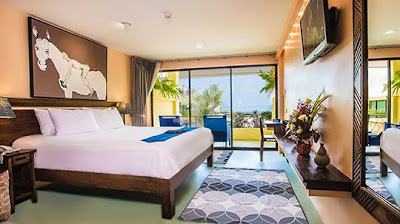 The name changed in 2012 to CC's Hideaway when the hotel was completed renovated and refurnished with hand crafted furniture and original artwork. 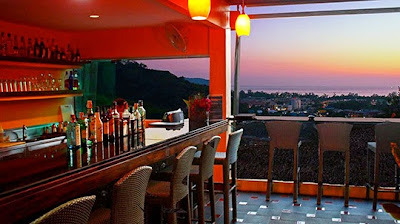 It's nice to hear of a different kind of place to stay in Phuket, just the kind of place that Jamie's Phuket is looking for, something off the beaten track, a hotel with a bit of character. Most of the rooms do have a sea view, just the sea is not right out of the window. The hills above Karon are very scenic and very ... what's the word ... green ... jungly. There are double or twin rooms and all have satellite TV and high speed internet access.